The Advance SC6500 rider scrubber combines easy control with effective, green cleaning in a strong, compact machine. It has up to a 48-inch cleaning path, making it easy to cover large, heavily soiled areas. It has the tightest aisle turn for its class and size. Cleaning time is maximized and made quicker by the scrubbers 70-gallon solution and recovery tanks. The AC brushless propulsion drive requires no maintenance and gives smooth, easy acceleration. Made to withstand harsh industrial environments its equipped with a bumper, deflectors on the machine’s frame, and is constructed from steel. Its made to last and be durable enough to handle all tough applications. The optional EcoFlex™ System allows the operator to use just the right amount of detergent, giving a powerful clean while minimizing waste. 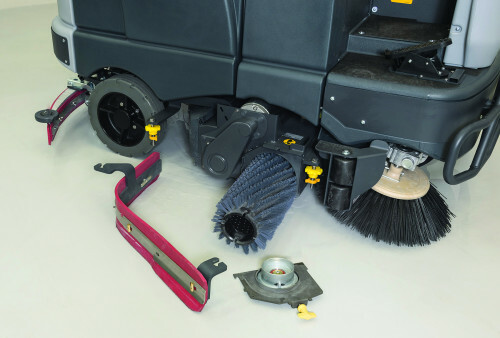 Unreachable edges are easy to get with the scrubber’s offset scrub deck. Cylindrical models have dual side brooms to provide excellent edge cleaning, preventing debris from reaching the squeegees, extending their life. Dual-disc brakes allow the operator to have complete control, even if the floors are wet. These features make the machine easily adaptable to whatever conditions it faces. The SC6500 is designed to be easy to maintain and daily maintenance tasks can be performed without the use of tools. All serviceable items are marked in yellow so that it is easy for the operator to identify maintenance points. 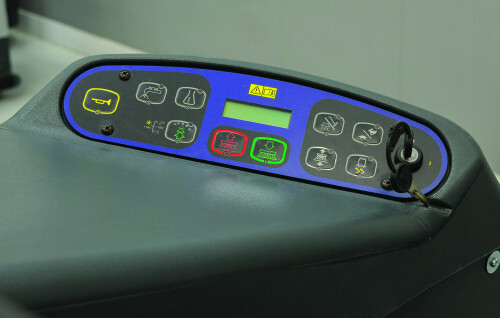 The control system on the SC6500 is very intuitive as each button has an icon that clearly indicates its function. One-Touch™ operation is utilized on this scrubber and the steering system is very ergonomic for the operator. Forward and reverse functionality is incorporated into the pedal with automatic braking.